The policy of Drug Testing America is to treat all customer information provided as strictly confidential for the sole purpose of completing a sale. Drug Testing America does not allow any part of your information to be used for any other purpose. We will not sell, share, rent, or otherwise release confidential customer information. Request a Return Goods Authorization number (RGA) by sending an e-mail to sales with your original order number, date, and item(s) you wish to return. An RGA number will be assigned and sent to you by return e-mail. Return the item(s) postage paid (insured return receipt is suggested on returns over $50.00). Be sure to mark the address with the assigned RGA # and include a copy of your original order, order number, or packing list to expedite processing and issuance of credit. Original shipping charges cannot be refunded. Important: Opened or used test kits or otherwise damaged goods cannot be returned, and credit will not be issued. Returns sent postage due, or freight collect will not be accepted. Furthermore, Drug Testing America cannot be responsible for unsolicited returns without an assigned return goods authorization number. Shipments are generally sent via UPS, USPS, or FedEx. We apologize that we cannot guarantee delivery times or service guidelines established by UPS, USPS, or FedEx, or be responsible for carrier shipment delays, lost shipments, stolen mail, clerical or typographical errors in shipping information provided by customers during their order entry process, or other similar delivery problems once shipments have left our distribution facilities. 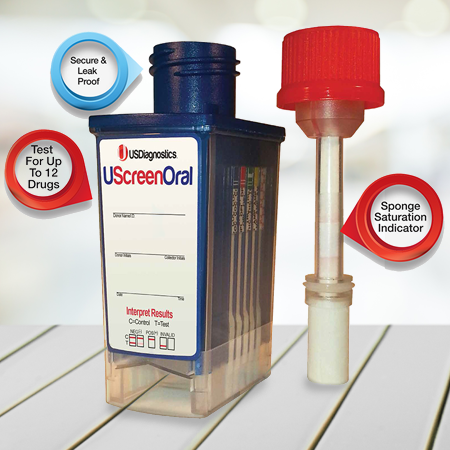 Drug Testing America disclaims all express and/or implied warranties with regard to the information, services, materials, and products contained on its Internet sites, including without limitation any implied warranties of merchantability, fitness for a particular purpose, and provided "as is" and "as available" without warranty of any kind. In no event shall Drug Testing America be liable for any special, indirect, punitive, incidental, exemplary, or consequential damages, or any damages whatsoever resulting from product use, loss of use, business, data or profits, litigation, and the like, whether based on breach of contract, tort (including negligence), product liability, or otherwise, even if advised of the possibility of such damages. With respect to goods or services purchased through this website, liability is expressly limited to replacement of defective goods, or, at Drug Testing America's election, to the repayment or crediting of the buyer with an amount equal to the purchase price of the goods. You acknowledge and agree that the limitations set forth above are fundamental elements of this agreement and the site would not be provided to you absent such limitations. Some state statutes might apply regarding limitation of liability.